Campaign launch, Belo Horizonte, Brazil. 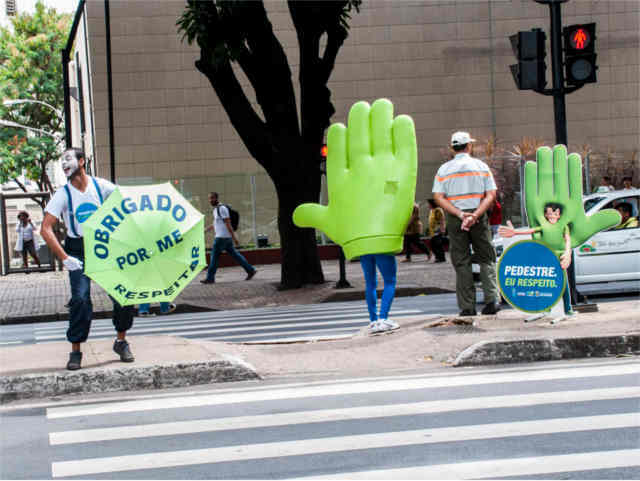 Belo Horizonte, Brazil, has taken an important step in protecting its pedestrians. 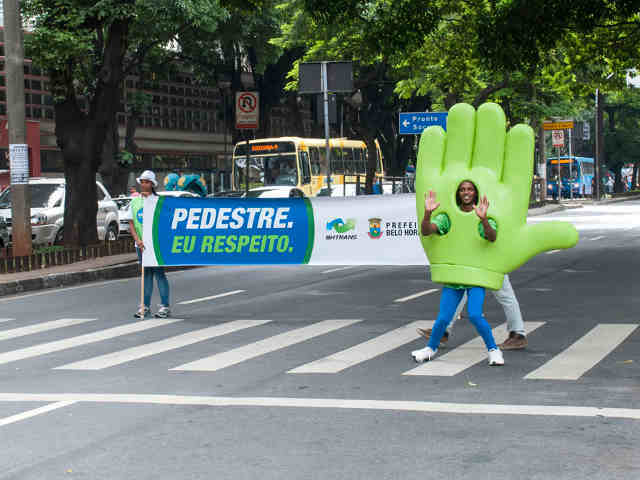 Two weeks ago, the capital of the eponymous Brazilian state launched the campaign, “Pedestrians. I respect” (“Pedestre. Eu Respeito”) on city streets. The launch of the program is the culmination of several months of planning, with data analyzed from 12 different areas in the south and central parts of the city. The local campaign fits within a larger initiative from the Brazilian Ministry of Health, called “Vida no Trânsito” [“Life in Transit”], and is expected to last for at least a year. The goal is a complete change of behavior, with “respect” as the keyword for the campaign. 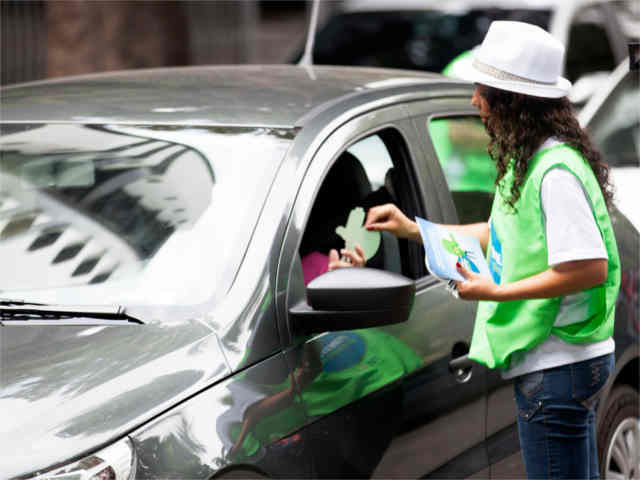 Traffic safety figures in Belo Horizonte justify the importance of the campaign. Every day, eight people are injured in accidents in Belo Horizonte. In 2011 alone, 76 deaths were registered in crashes in the capital. with the elderly the most vulnerable as shown in the data. Of the 76 deaths, 25 were people over 60 years of age. In 2010, elderly victims accounted for 31 of the 105 traffic accidents deaths. With the support of professional associations, businesses, schools and universities, the media, and organized parts of civil society, Belo Horizonte will change this grim reality. It is important to realize that traffic injuries are not inevitable. They are the result of risky behaviors, whether from the driver, biker, cyclist, or pedestrian. It is our collective responsibility to end road injuries and deaths. Respect it is more than a kindness: it is a duty. The main message of the campaign is to respect the right of way of crossing pedestrians. The Brazilian Traffic Code (CTB) establishes that this behavior should be adopted by drivers. It’s time we start simply admiring the cities where cars stop for pedestrians. “Let’s all adopt this behavior and be proud of Belo Horizonte,” said the director of Information Services at BHTRANS, Jussara Bellavinha. Belo Horizonte’s hospital area – where 99,000 vehicles transit daily, and where there is a concentration of people coming from other cities – was where the campaign was launched. The idea is that each one of the 12 targeted areas in the city will successively be the priority for four weeks in a row. This means that the whole program will last for a year without interruption. In addition, there will be educational events at transit agency locations and also at other locations outside of the core central and southern regions of the city, in particular in other densely populated areas. Teams of interns will take turns, Monday through Friday mornings and afternoons, interacting with drivers, motorcyclists and pedestrians. They will be stationed at intersections and the busiest crossings. Besides the interns, the actions in the streets will involve the “Hands” – mascots and symbols of the campaign – with mimes and agents of the transit agency BHTrans. The approach is educational at its core but with an additional layer of police enforcement in targeted areas. The campaign will be supported by enforcement from the Military Police and the local Guard. In the area of the hospital, the major intersections and pedestrian crossings with traffic lights are the avenues of Alfredo Balena, Francisco Sales, and Brazil. They see the traffic of 5,030 buses passing through everyday and 521 at peak times. Of the 99,000 vehicles that pass through the area between 6 am and 9 pm, 10,800 are concentrated during peak hours. The campaign, “Pedestrians. I Respect,” is not limited to education and enforcement. According to Jussara Bellavinha, director of Information Services at BHTRANS, infrastructure improvements to pedestrian crossings will also been conducted on the sides of the campaign. “We’re doing a great job of improving the routes, checking the crossing time, and do not need additional lanes for crossing. Our plan, throughout this year, is to increase the number of traffic lights for pedestrians. Let’s work on the educational part, but also take care of engineering to have a significant improvement with a focus on pedestrians “.